Alternative energy sources are gradually replacing fossil fuels, but can oil be replaced in the production of the plastics we all use in our daily lives? Innovative technologies are replacing oil with vegetable components to make plastics with fascinating properties. Spanish scientists and engineers are developing the eco-friendly and smart plastic packaging of tomorrow. In the AITIIP lab in Zaragosa bio-polymers extracted from agricultural waste are mixed with nano-additives and melted at 200 degrees celsius. That is the basic recipe for the new bioplastic developed within a European research project. The combination of components makes the new material robust and gives it special features. For instance, nano-clays create large-surface, one- nanometer-thin films that act as a protective barrier. 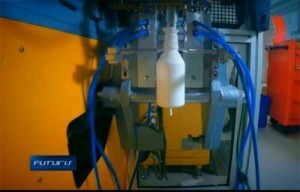 Euronews’ Denis Loctier asked Industrial Engineer Lidia Garcia how was the material better than conventional plastics? So far, industrial use of bioplastics has been limited. Biodegradable containers were not durable enough to protect food, cosmetics or pharmaceutical products. Poor plasticity of such materials made them incompatible with existing production lines. The new bioplastic solves these problems. “In this case, nano-materials are being used in order to increase the mechanical strength of the material and also to improve the barrier properties to protect the contents from oxygen. This material can be used with typical extrusion moulding machines to produce the required packaging,” says Organic Chemist Pere Castell. Researchers came up with a composition that can be processed industrially in a very similar way to existing, non-biodegradable plastics. “That’s our role as a technological research centre, to bridge the gap between the science and the industrial applications, to simplify bringing the innovations to the plants and to the market. If you want to use a new packaging material or intelligent labels, you need scientific support, and it’s our job to accompany the industry,” says AITIIP’s Dibbiopack project co-ordinator, Industrial Engineer Berta Gontalvo. 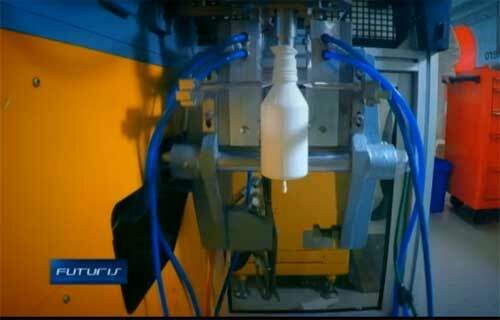 Injection moulding is perfect for making cosmetics jars: an industrial-grade machine injects liquid plastic into a steel mould applying up to 85 tons of pressure. In about 30 seconds, the polymer solidifies. Innovations do not stop there: researchers are trying to make the packaging smarter by integrating sensors and communication devices. “We can build in a composite sensor. One part contains a radio frequency tag. In the centre there is a plastic film that is sensitive to oxygen. So if oxygen goes above the threshold level of two percent, the structure of the plastic changes, and it changes colour,” says Professor of Electronic Engineering at Galway NUI, Gearóid ÓLaighin. A biodegradable bottle that will safely preserve its contents and alert shoppers if the product has spoiled; this is the plastic of tomorrow.